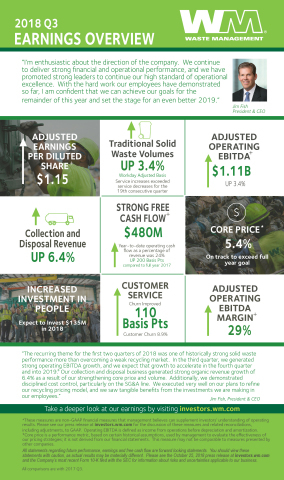 In the third quarter, revenue growth was driven by strong yield and volume growth in the Company’s collection and disposal business, which contributed $200 million of incremental revenue. This was partially offset by a decline in revenue from the Company’s recycling line of business, which fell by $52 million year-over-year in the third quarter of 2018. Internal revenue growth from yield for collection and disposal operations was 2.5% for the third quarter of 2018 versus 2.0% in the third quarter of 2017. Traditional solid waste internal revenue growth from volume was 3.2%, or 3.4% on a workday adjusted basis, in the third quarter of 2018. Total Company internal revenue growth from volume, which includes our recycling and other ancillary businesses, was 4.2%, or 4.4% on a workday adjusted basis, in the third quarter. Average recycling commodity prices at the Company’s facilities were approximately 47% lower in the third quarter of 2018 compared to the prior year period. Results for the Company’s recycling line of business declined by approximately $0.04 per diluted share when compared to the third quarter of 2017. The Company continues to expect the full-year impact from recycling to be a negative $0.17 to $0.20 per diluted share. As a percentage of revenue, total Company operating expenses were 62.1% in the third quarter of 2018 compared to 61.9% in the third quarter of 2017. The increase in operating expense is primarily driven by core solid waste volume growth, acquisitions, inflationary cost pressures and investment being made in the Company’s employees. As a percentage of revenue, SG&A expenses were 9.0% in the third quarter of 2018 compared to 9.6% in the third quarter of 2017. Net cash provided by operating activities was $874 million in the third quarter of 2018, compared to $853 million in the third quarter of 2017. Capital expenditures were $404 million in the third quarter of 2018, a $54 million increase from the third quarter of 2017. Free cash flow was $480 million in the third quarter of 2018, compared to $509 million in the third quarter of 2017. (b) The decrease in the current quarter free cash flow was driven by increased capital spending as the Company continues to invest in its fleet and disposal network to support growth. The Company paid $199 million in dividends to shareholders and spent $200 million to repurchase shares in the third quarter of 2018. The Company spent $79 million on acquisitions of traditional solid waste businesses during the third quarter of 2018. The Company’s adjusted earnings per share guidance range increased from $4.05 to $4.10 to $4.13 to $4.15. The Company expects to meet or exceed analysts’ current 2018 consensus for adjusted operating EBITDA of $4.204 billion and narrows its range to $4.2 billion to $4.22 billion. The Company expects to meet or exceed analysts’ current 2018 consensus of $1.95 billion for free cash flow and narrows its range to $1.95 billion to $2.0 billion. Prior year information has been revised to reflect the adoption of Accounting Standards Update (ASU) 2016-15 and ASU 2016-18 and conform to our current year presentation. (b) Prior year information has been revised to reflect the adoption of ASU 2016-18 and conform to our current year presentation. (c) Represents amounts associated with business acquisitions consummated during the applicable period except where noted. (a) For purposes of this press release table, all references to "Net income" refer to the financial statement line item "Net income attributable to Waste Management, Inc."
(b) The Company calculates its effective tax rate based on actual dollars. When the effective tax rate is calculated by dividing the Tax Expense amount in the table above by the Pre-tax Income amount, differences occur due to rounding, as these items have been rounded in millions. The adjusted effective tax rates is 21.3% for the third quarter of 2018. (a) Adjusted operating EBITDA increased $36 million or 3.4% for the third quarter 2018 as compared with adjusted operating EBITDA in the third quarter 2017. (b) Adjusted operating EBITDA increased $32 million or 3.1% for the second quarter 2018 as compared with as reported operating EBITDA for the second quarter 2017. (c) The reconciliation includes two scenarios that illustrate our projected free cash flow range for 2018. The amounts used in the reconciliation are subject to many variables, some of which are not under our control and, therefore, are not necessarily indicative of actual results.